With the arrival of Monday, it’s back to work. It was a bloody good weekend. Went down to Dorest to see Fade & HeX and the kiddies. Did a lot of chatting and giggling. Their eldest son really loves World of Warcraft. It’s the knights and horses. But then again it can also be a 4 year old’s fascination with splashing noises. So many hours spent running various characters around the virtual world. Now it’s Monday. So sort through the various emails from work and get the forms filled in and what not. There was only one job to contend with and that was for a retail site in Cheltenham. So nice and close by. And an added surprise was that the problem with the cash draw not firing had resolved it’s self by the time I had arrived. Excellent. Self repairing kit. 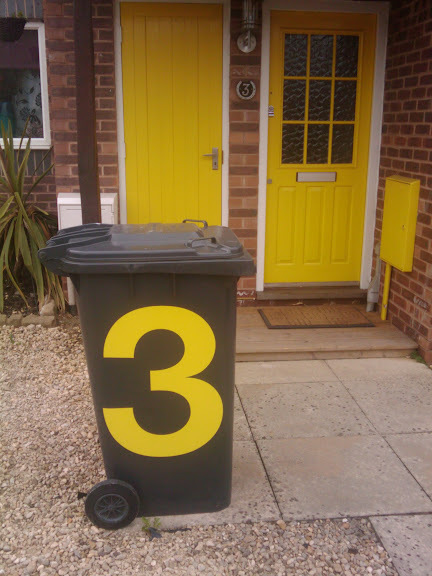 After work had finished for the day I set about sticking the giant yellow number 3s to the wheelie bin. I ended up with one or two air bubbles, so it looks like a cross between cheese and and an aero bar. But I’m very chuffed with the results. Some how I feel that my neighbour isn’t so chuffed. For some reason she felt the need to turn the bin around when she got home, so that the number was no longer visible from the road. I have a theory that she doesn’t like anything that that draws attention to the fact that it’s not one house, but two maisonettes. Years ago she got really snotty about me painting the front door as her blind in her bed room matched it. Now I’ve stuck a giant three foot high industrial hazard yellow number three on each side of the bin. Next door but two has dolphins on her’s. Neighbours can be odd and fickle at times. Lets see how long it takes for my bin to get vandalised?